This article is about the English actor. For the American punk rock musician, see Dan Stevens (musician). Daniel Jonathan Stevens (born 10 October 1982) is an English actor. He first drew international attention for his role as Matthew Crawley in the ITV acclaimed period drama series Downton Abbey (2010–12). He also starred as David in the thriller film The Guest (2014), Sir Lancelot in the adventure film Night at the Museum: Secret of the Tomb (2014), The Beast/Prince in Disney's live action adaptation of Beauty and the Beast (2017), Lorin Willis in the biographical legal drama Marshall (2017), and Charles Dickens in the biographical drama The Man Who Invented Christmas (2017). Since 2017, he has starred as David Haller in the FX series Legion. In 2018, he starred in the Netflix horror-thriller Apostle. Stevens was born in Croydon, London. He was adopted at birth, by parents who were both teachers, and grew up in Wales and southeast England. He has a younger brother who was also adopted. Stevens boarded on a scholarship at Tonbridge School, an independent school in Kent. There he became interested in drama after auditioning for the title role in Macbeth with his teacher, novelist Jonathan Smith. From the age of 15, he spent his summers training and performing with the National Youth Theatre in London. Stevens studied English Literature at Emmanuel College, Cambridge. While at Cambridge, he was a member of the Footlights with Stefan Golaszewski, Tim Key and Mark Watson, and was also active in the Marlowe Society. He was first spotted by director Peter Hall at a Marlowe Society production of Macbeth, in which he played the title character alongside Hall's daughter, actress Rebecca Hall. In 2004, Stevens began his professional acting career when Peter Hall cast him as Orlando in his touring production of Shakespeare's As You Like It. The tour took the production to the Rose Theatre in Kingston upon Thames, the Brooklyn Academy of Music in New York City, the Curran Theatre in San Francisco, and the Ahmanson Theatre in Los Angeles. His debut performance earned him glowing reviews from prominent critics in Britain and the United States, as well as a commendation at the 2004 Ian Charleson Awards. In 2006, Stevens starred as Nick Guest in the BBC adaptation of Alan Hollinghurst's Booker Prize-winning novel The Line of Beauty. Later that year, he played Simon Bliss in Hay Fever by Noël Coward at London's Haymarket Theatre, alongside Peter Bowles and Dame Judi Dench; the director was Peter Hall. He also performed as Lord Holmwood in an adaptation of Dracula for the BBC, and as Basil Brookes in the BBC Emmy-award-winning film, Maxwell. That same year, he was named one of Screen International's 2006 Stars Of Tomorrow. In 2008, Stevens appeared in the BBC adaptation of Jane Austen's novel, Sense & Sensibility, playing Edward Ferrars, and the West End revival of Noël Coward's The Vortex. In January 2009, he appeared on New Year's Day in Agatha Christie's Marple: Nemesis on ITV1 in Britain. In June 2009, he returned to the West End, playing Septimus Hodge in an acclaimed revival of Tom Stoppard's Arcadia at the Duke of York's Theatre. In 2010, Stevens got his biggest break when he was cast as Matthew Crawley in the ITV series Downton Abbey, created and written by Oscar-winning screenwriter Julian Fellowes. The series went on to be a global sensation and has been nominated for several Emmy, BAFTA, Golden Globe and Screen Actors Guild Awards since its debut. The central love story of Matthew Crawley and his distant cousin, Lady Mary Crawley, played by Michelle Dockery, was enormously popular. Stevens left the series after finishing the third season and the Christmas Special in 2012. His exit caused a huge uproar with fans, who notably took to Twitter and other social media sites to express their anger at the character's death. In November 2011, Stevens guest-hosted an episode of Have I Got News for You. In March 2012, he completed shooting Vamps, the latest film from Amy Heckerling, and Summer in February, an Edwardian romance film set in an artist colony. Also in 2012, Stevens moved with his family to New York City, when he made his Broadway debut that year opposite Jessica Chastain and David Strathairn in The Heiress. In 2014, Stevens starred in the independent film The Guest, winning critical acclaim for his portrayal of a recently discharged army veteran who goes on a killing spree to protect his true identity. He earned a Saturn Award for Best Actor nomination for his performance. Also in 2014, he appeared in the magic realism comedy-drama film The Cobbler, and in the dark action film A Walk Among the Tombstones. He played a simulacrum of Sir Lancelot in the 2014 comedy film Night at the Museum: Secret of the Tomb. Stevens played the Beast, opposite Emma Watson as Belle, in Disney's live action remake adaptation of Beauty and the Beast. The film was released in March 2017, and earned over $1.2 billion in worldwide box office revenue, making it the second highest-grossing film of 2017, and the 14th highest-grossing film of all time. Stevens at the 2019 WonderCon promoting Legion. 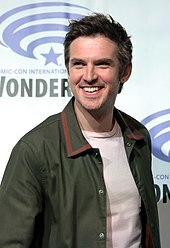 In February 2016, Stevens was cast in the lead role of David Charles Haller in the FX series Legion, an X-Men-related drama created by Noah Hawley. The series began airing in February 2017 and received critical acclaim; a second season aired the next year, and Legion was renewed for a third season in June 2018. Stevens then appeared in Marshall with Chadwick Boseman, Josh Gad and Kate Hudson, and The Man Who Invented Christmas, directed by Bharat Nalluri, and co-starring Christopher Plummer and Jonathan Pryce. In 2018, Stevens starred in the Netflix thriller film Apostle, directed by Gareth Huw Evans. The film released on 12 October 2018. Stevens has narrated over 31 audiobooks, including Casino Royale, Wolf Hall and War Horse. In 2014, he was nominated for two Audie Awards, in the Classic category and Solo Narration (Male) category for Frankenstein. Outside acting, Stevens maintains an interest in writing and literature and is editor-at-large for The Junket, an online quarterly which he co-founded in 2011 with some friends. He was a member of the judging panel for the 2012 Man Booker Prize for Fiction, and was a regular columnist for the Sunday Telegraph. A cricket enthusiast, he played for the Authors XI team, which is composed of a number of prominent British writers, in 2012. He also contributed a chapter to the team's book The Authors XI: A Season of English Cricket from Hackney to Hambledon, which was shortlisted for the 2014 Cricket Society and M.C.C. Book of the Year Award. In 2009, Stevens married South African jazz singer and singing teacher Susie Hariet. They met in 2006, when appearing at different theatres in Sheffield. They have three children: daughters Willow (born 2009) and Eden (born 2016), and a son, Aubrey (born 2012). Actress Rebecca Hall is godmother to his daughter Willow. Stevens endorsed Senator Bernie Sanders for President in the 2016 U.S. presidential election. 2007 Agatha Christie's Marple Michael Faber Episode: "Nemesis"
^ "Dan Stevens profile". UK Cinema Release Dates. ^ "Dan Stevens @ Talented British Actors". Archived from the original on 2009-05-22. ^ a b "He does prefer redheads! Downton Abbey star Dan Stevens on why his wife is his only leading lady". Daily Mail. 15 November 2011. Retrieved 2 January 2012. ^ Ginia Bellafante (1 January 2013). "Dan Stevens Interview - Downtown Abbey's Dan Stevens". Town & Country Magazine. ^ a b c d "I'm not really posh, says 'Downton Abbey' actor Dan Stevens". The Daily Telegraph. 27 August 2011. Retrieved 2 January 2012. ^ "The best teachers will always bowl you over". The Guardian. 19 June 2011. ^ "Dan Stevens: My Best Teacher". Times Educational Supplement. 23 September 2011. ^ Hardy, Rebecca (23 December 2011). "Abbey Christmas! Will Downton's Matthew get Mary? That'd be telling". Daily Mail. ^ "Cambridge Alumni News - Highlights: March 2017". Cambridge in America. ^ Gannon, Louise (3 September 2011). "'I spent most of my early years totally rebelling against anything I could': Dan Stevens on how he went from rebellious youth to Downton Abbey's heir apparent". Daily Mail. Retrieved 3 October 2011. ^ "Footlights Alumni 2000-2009". Footlights. Archived from the original on 15 October 2012. ^ "Macbeth". Marlowe Society. 2002. Archived from the original on 23 December 2012. ^ "Rebecca Hall takes the lead". The Daily Telegraph. 29 October 2011. ^ "Dan Stevens Interview: How Being 'Downton Abbey's Hero Has Changed His Life". Huffington Post. 4 November 2011. ^ Charles Spencer (7 December 2004). "New dreams blossom in Hall's Indian summer". The Telegraph. ^ Ben Brantley (28 January 2005). "The Listings: DAN STEVENS". New York Times. ^ Joel Hirschhorn (8 February 2006). "Review: 'As You Like It'". Variety. ^ Diane Haithman (25 February 2005). "Taking the fast lane to success". Los Angeles Times. ^ "Ian Charleson award-winners". The Sunday Times. 22 May 2005. Retrieved 8 November 2014. ^ "Close-up: Dan Stevens". The Independent. 24 February 2008. ^ "Screen, BFI London Film Festival team for Stars of Tomorrow". ^ Bosanquet, Theo. "Critics Hail Stoppard's Arcadia". Review Round-up. Whatsonstage.com. Retrieved 2009-06-09. ^ "Dan Stevens Interview: How Being Downton Abbey's Hero Has Changed His Life". Huffington Post. 11 April 2011. ^ "Oscars.org - Julian Fellowes winning the Oscar for Gosford Park". ^ a b Brown, Mark (13 December 2011). "Downton Abbey actor named as Booker judge". The Guardian. London. p. 7. ^ Griffiths, Sarah Jane (9 September 2012). "The Downton Abbey 'phenomenon'". BBC News. ^ "SPOILER ALERT: Will Lady Mary and Matthew Crawley finally get together?". Mail Online. 1 December 2011. ^ "'Downton Abbey' Season 4: Dan Stevens Officially Not Returning". Huffington Post. 26 December 2012. ^ "Downton Abbey' team tries to reassure fans after criticism over death of Dan Stevens' Matthew Crawley". NY Daily News. 19 February 2013. ^ Jury, Louise (9 March 2012). "Abbey vs Abba as heart-throbs play love rivals". London Evening Standard. Retrieved 23 March 2012. ^ "Dan Stevens in Brooklyn". The New Yorker. 6 October 2014. ^ "Dan Stevens: Why I left Downton Abbey". The Telegraph. 26 December 2012. ^ "A Dangerous Visitor Makes Himself at Home". The New York Times. 16 September 2014. ^ "Review: In The Guest, Dan Stevens Goes From Downton Abbey to Dirty, Deranged Harry". Time. 16 September 2014. ^ "Review Dan Stevens gives 'The Guest' its psychotic, thrilling charm". Los Angeles Times. 15 September 2014. ^ Jeff Sneider (7 March 2014). "Picturehouse Acquires Adam Wingard's 'The Guest' Starring Dan Stevens". The Wrap. ^ "Watch: Liam Neeson and Dan Stevens Will 'Walk Among the Tombstones' in September". BBC America. 30 May 2014. ^ Kevin Jagernauth (6 January 2014). "First Look:Adam Sandler Isn't Farting In Thomas McCarthy's 'The Cobbler'". The Playlist. ^ Mike Fleming Jr (2013-11-09). "'Downton Abbey's Dan Stevens Joins 'Night At The Museum 3' As Lancelot - Deadline". Deadline. ^ Borys Kit (4 March 2015). "Disney's 'Beauty and the Beast' Casting Dan Stevens as the Beast (Exclusive)". The Hollywood Reporter. ^ "Beauty and the Beast (2017)". Box Office Mojo. Retrieved 18 September 2017. ^ Franklin, Garth (2016-02-04). "Dan Stevens Leads X-Men Series "Legion"". Dark Horizons. Retrieved 2017-02-01. ^ Goldberg, Lesley (15 March 2017). "Noah Hawley's Marvel Drama 'Legion' Renewed for Second Season at FX". The Hollywood Reporter. Retrieved 23 April 2017. ^ Otterson, Joe (June 2018). "'Legion' Renewed for Season 3 at FX". Variety. Variety. Retrieved 16 July 2018. ^ "'Marshall' Trailer: Chadwick Boseman Fights the Good Fight in Courtroom Thriller". Collider. 22 June 2017. ^ Lang, Brent (2016-11-07). "Bleecker Street Nabs Charles Dickins Biopic With Dan Stevens, Christopher Plummer". variety.com. Retrieved 7 November 2016. ^ "First trailer for Netflix Apostle movie looks bloody terrifying". CNET. 2018-09-17. Retrieved 2018-09-24. ^ Jackson, Dan (2018-09-17). "Netflix's Bloody New Cult Movie 'Apostle' Looks Terrifying". Thrillist. Retrieved 2018-09-24. ^ "Dan Stevens, Jake Gyllenhaal score Audie nominations". USA Today. 18 February 2014. ^ "Dan Stevens takes the helm at literary magazine". The Daily Telegraph. 1 February 2013. ^ "That's bound to shake up the literature critics: Downton Abbey star Dan Stevens joins 2012 Booker judging panel". Daily Mail. 13 December 2011. Retrieved 23 March 2012. ^ "Dan Stevens". Archived from the original on 14 October 2012. ^ "A Dan for All Seasons". Wall Street Journal. 15 October 2012. ^ "Dan Stevens goes to bat for poetry". The Daily Telegraph. 9 July 2012. ^ The Authors XI: A Season of English Cricket from Hackney to Hambledon. A & C Black. 2013. ISBN 9781408840467. ^ "The Cricket Society and M.C.C. Book of the Year Award 2014". The Cricket Society. Archived from the original on 3 February 2015. ^ Balls, Tim Walker Edited by Katy (2012-08-20). "Downton Abbey star Dan Stevens's joy over extra passenger". The Telegraph. Retrieved 20 August 2012. ^ "Sunday Telegraph September column & Sunday Times interview". 9 September 2012. ^ "Dan Stevens decorates for Christmas just after Halloween". The Star U.K. Retrieved 23 December 2017. ^ "Downton Abbey's Dan Stevens goes to Hollywood". The Times. 6 September 2014. ^ Tatiana Siegel (April 16, 2016). "Rapid Round: Dan Stevens Talks About Life Post-'Downton Abbey,' Joining the Marvel Universe and Becoming The Beast (Q&A)". The Hollywood Reporter. Retrieved May 25, 2016. ^ "A pair of British classics". 8 July 2005. ^ "Brenton's Romans in Britain Faces Fresh Protests". 8 February 2006. ^ "Flu Fells Dench, Hay Fever Cancels Four Previews". 6 April 2006. ^ "Divas 'Dancical' Honours Piaf, Garland & Dietrich". 4 April 2008. ^ "Every Good Boy Deserves Favour". Archived from the original on 4 November 2010. ^ What's on stage, ed. (8 June 2009). "Critics Hail Stoppard's Arcadia". ^ "DOWNTON ABBEY Star Dan Stevens to Join Jessica Chastain & David Strathairn in THE HEIRESS on Broadway - October 2012!". ^ The Dragon's Eye. Retrieved 24 March 2017. ^ Die With Me. Retrieved 24 March 2017. ^ Strike Back. Retrieved 24 March 2017. ^ Day. Retrieved 24 March 2017. ^ The Outcast. Retrieved 24 March 2017. ^ The Dragon Diary: Dragonology Chronicles, Volume 2. Retrieved 24 March 2017. ^ The Angel's Game. Retrieved 24 March 2017. ^ A Week in December. Retrieved 24 March 2017. ^ Wolf Hall. Retrieved 24 March 2017. ^ War Horse. Retrieved 24 March 2017. ^ Blueeyedboy. Retrieved 24 March 2017. ^ The Prince of Mist. Retrieved 24 March 2017. ^ Young Sherlock Holmes: The Death Cloud. Retrieved 24 March 2017. ^ Fall of Giants: The Century Trilogy, Book 1. Retrieved 24 March 2017. ^ Young Sherlock Holmes 2: Red Leech. Retrieved 24 March 2017. ^ My Dear I Wanted to Tell You. Retrieved 24 March 2017. ^ "My Dear I Wanted To Tell You wins inaugural audiobook award". Retrieved 28 May 2017. ^ The Midnight Palace. Retrieved 24 March 2017. ^ History of a Pleasure Seeker. Retrieved 24 March 2017. ^ The Invisible Ones. Retrieved 24 March 2017. ^ The Time Keeper. Retrieved 24 March 2017. ^ Casino Royale Audiobook - Ian Fleming - Audible.com. Retrieved 24 March 2017. ^ "Specsavers National Book Awards 2012 shortlist". Retrieved 28 May 2017. ^ Letters from Everest: A First-Hand Account from the Epic First Ascent. Retrieved 24 March 2017. ^ Going Solo. Retrieved 24 March 2017. ^ Boy. Retrieved 24 March 2017. ^ Frankenstein. Retrieved 24 March 2017. ^ "Finalists Announced for 19th Annual Audie Awards". Retrieved 24 March 2017. ^ Letters to a Young Poet. Retrieved 24 March 2017. ^ Murder on the Orient Express. Retrieved 24 March 2017. ^ And Then There Were None. Retrieved 24 March 2017. ^ The Heroes' Welcome. Retrieved 24 March 2017. ^ Scorpia Rising Audiobook - Anthony Horowitz - Audible.com. Retrieved 24 March 2017. ^ Snakehead Audiobook - Anthony Horowitz - Audible.com. Retrieved 24 March 2017. ^ Crocodile Tears Audiobook - Anthony Horowitz - Audible.com. Retrieved 24 March 2017. ^ The Iliad Audiobook - Homer, Robert Fitzgerald - translator - Audible.com. Retrieved 24 March 2017. ^ "2015 Audie Award Nominees". Retrieved 24 March 2017. ^ "Saturday Drama, The Tennis Court". BBC Radio 4. 2010-04-24. Retrieved 2014-04-22. ^ "- Dickens Confidential, Series 2, Gangs of London". BBC Radio 4 Extra. ^ "BBC - The One Show - One Passions Blog: WW1 Armistice exhibition. Also: Click here for actor Dan Stevens reading Anthem for Doomed Youth". ^ "Classic Serial, Orley Farm, Episode 1". BBC Radio 4. 2009-01-03. Retrieved 2014-04-22. ^ "15 Minute Drama, The Lady of the Camellias, Episode 1". BBC Radio 4. 2009-02-02. Retrieved 2014-04-22. ^ "Afternoon Drama, Guilty Until Proved Innocent". BBC Radio 4. ^ "Book of the Week, William Fiennes - The Music Room". BBC Radio 4. ^ "Classic Serial, Edith Wharton - The Custom of the Country, Episode 1". BBC Radio 4. 2013-09-03. Retrieved 2014-04-22. ^ "Classic Serial, The Complete Smiley - The Secret Pilgrim, Episode 1". BBC Radio 4. 2010-06-19. Retrieved 2014-04-22. ^ "Book at Bedtime, Rebecca Stott - The Coral Thief". BBC Radio 4. ^ "Afternoon Reading, EM Forster Short Stories, The Story of the Siren". BBC Radio 4. ^ "BBC Radio 3 - Drama on 3, A Thousand Kisses". BBC Radio 3. ^ "BBC Radio 3 - Drama on 3, Widowers' Houses". BBC Radio 3. ^ "Radio 4 - Afternoon Drama, Portrait of Winston". Retrieved 24 March 2017. ^ "King James Bible, Readings, Episode 6". BBC Radio 4. ^ "Extra - A Short History of Vampires, Dracula's Guest". BBC Radio 4. ^ "Words and Music, Money". BBC Radio 3. ^ "Afternoon Reading, Face It, Together". BBC Radio 4. ^ "Extra - The Spying Game, The Living Daylights". BBC Radio 4. ^ "Something Understood, Dawn". BBC Radio 4. ^ "Book of the Week, The Old Ways". BBC Radio 4. 2012-07-07. Retrieved 2014-04-22. Wikimedia Commons has media related to Dan Stevens.